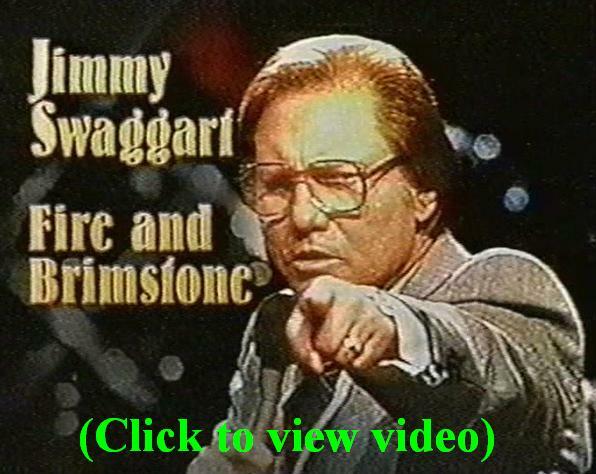 On the 21st of February 1988, Jimmy Swaggart stood before his congregation at the Family Worship Center in Baton Rouge, LA, publicly confessing to the World that he had sinned. Since that time the Lord has taken him back to the “Cross Of Calvary” in an effort to break the “chains” that had him “bound” to sin. Without a doubt Brother Swaggart loves the Lord Jesus Christ…however, he’s missing a few important pieces of the puzzle when it comes to understanding what Jesus actually accomplished at the Cross. And because of this problem we were commissioned by the Lord to write several sermonets of correction especially for him: Jimmy Swaggart And The Accursed! (12/30/01), Jimmy Swaggart And The "Since" That Should Have Remained "If"! (3/24/02), Jimmy Swaggart And His Spiritual Adultery! (4/21/02), and Is Jimmy Swaggart’s Wife Frances Really Uncovered? (5/5/02). "The Believer must understand, that the power of sin is so great, that no individual on earth, even the strongest Christian can overcome this monster within his own strength and ability. It simply cannot be done." Everything that I will attempt to say to you this morning will be from my heart. I will not speak from a prepared script. Knowing the consequences of what I will say and that much of it will be taken around the world, as it should be, I am positive that all that I want to say I will not be able to articulate as I would desire. But I would pray that you will somehow feel the anguish, the pain, and the love of my heart. I have always -- every single time that I have stood before a congregation and a television camera -- I have met and faced the issues head-on. I have never sidestepped or skirted unpleasantries. I have tried to be like a man and to preach this gospel exactly as I have seen it without fear or reservation or compromise. I can do no less this morning. I do not plan in any way to whitewash my sin. I do not call it a mistake, a mendacity; I call it sin. I would much rather, if possible -- and in my estimation it would not be possible -- to make it worse than less than it actually is. I have no one but myself to blame. I do not lay the fault or the blame of the charge at anyone else's feet. For no one is to blame but Jimmy Swaggart. I take the responsibility. I take the blame. I take the fault. Many times I have addressed the media in a very stern manner, and I have chastised them for what I thought and believed was error in their reporting or their investigation even. This time I do not. I commend them. I feel that the media, both in print and by television, radio, have been fair and objective and even compassionate. Ted Koppel on "Nightline," I feel, did everything within his power, in going the second, third, fourth, fifth, tenth mile to make doubly certain that what he reported was at least as fair and as honest as he, the spokesman for this world-famed news program, could make it. And I thank him for his objectivity, his kindness, and his fairness. And I also want to express appreciation to the entire media everywhere, but especially here in Baton Rouge -- Channels 9, 2, and 33, the newspapers, the radio stations. They've been hard, but they have been fair. They have been objective and at times, I believe, they have even been compassionate -- even my old nemesis, John Camp, that we have disagreed with very strongly. And I love you, John. And in spite of our differences, I think you are one of the finest investigative reporters in the world -- and I mean that. I want to address myself as best as I know how to those that I have wronged, that I have sinned against. First of all, my wife, Frances -- God never gave a man a better helpmate and companion to stand beside him. And as far as this gospel has been taken through the airwaves to the great cities of the world and covered this globe, it would never have been done were it not for her strength, her courage, her consecration to her Redeemer, the Lord Jesus Christ. I have sinned against you. And I beg your forgiveness. God said to David 3,000 years ago, you have done this thing in secret, but I will do what I do openly before all of Israel. My sin was done in secret, and God has said to me, "I will do what I do before the whole world." Blessed be the name of the Lord. God could never give a man, a father, a minister of the gospel, a finer son than he has given me and his mother -- Donnie and my beautiful and lovely daughter-in-law, Debbie. Donnie has stood with me. I have relied upon him. And in these trying days, his mother and myself, we do not know what we would have done without his strength, his courage, and his utter devotion to the Lord Jesus Christ. Donnie and Debbie, I have sinned against you and I beg you to forgive me. To the Assemblies of God, which helped bring the gospel to my little beleaguered town when my family was lost without Jesus -- this movement and fellowship that ...has been more instrumental in taking this gospel through the...night of darkness to the far-flung hundreds of millions than maybe in the effort in annals of human history. Its leadership has been compassionate and kind and considerate and long-suffering toward me without exception, but never for one moment condoning sin, both on the national level and this esteemed district level. But to its thousands and thousands of pastors that are godly, that uphold the standard of righteousness, its evangelists that are heralds and criers of redemption, its missionaries on the front lines...holding back the path of hell -- I have sinned against you and I have brought disgrace and humiliation and embarrassment upon you. I beg your forgiveness. This church [Family Worship Center], this ministry, this Bible college [Jimmy Swaggart Bible College], these professors, this choir, these musicians, these singers that have stood with me on a thousand crusade platforms around the world, that have labored unstintedly [sic] and tirelessly to lift up that great name of Jesus Christ, to tell the weary that He is rest, and the sin-cursed that he, Jesus, is victory, my associates -- and no evangelist ever had a greater group of men and women, given by the hand of God -- have stood with me unstintedly [sic], unflaggingly. I have sinned against you. I have brought shame and embarrassment to you. I beg your forgiveness. To my fellow television ministers and evagelists, you that are already bearing an almost unbearable load, to continue to say and tell the great story of Jesus' love, I have made your load heavier and I have hurt you. Please forgive me for sinning against you. And to the hundreds of millions that I have stood before in over a hundred countries of the world, and I've looked into the cameras and so many of you with a heart of loneliness, needing help, have reached out to the minister of the gospel as a beacon of light. You that are nameless -- most I will never be able to see except by faith. I have sinned against you. I beg you to forgive me. And most of all, to my Lord and my Savior, my Redeemer, the One whom I have served and I love and I worship. I bow at His feet, who has saved me and washed me and cleansed me. I have sinned against You, my Lord. And I would ask that Your precious blood would wash and cleanse every stain, until it is in the seas of God's forgetfulness, never to be remembered against me anymore. I say unto you that watch me today, through His mercy, His grace and His love, the sin of which I speak is not a present sin; it is a past sin. I know that so many would ask why, why? I have asked myself that 10,000 times through 10,000 tears. Maybe Jimmy Swaggart has tried to live his entire life as though he were not human. And I have thought that with the Lord, knowing He is omnipotent and omniscient, that there was nothing I could not do -- and I emphasize with His help and guidance. And I think this is the reason (in my limited knowledge) that I did not find the victory I sought because I did not seek the help of my brothers and my sisters in the Lord. I have had to come to the realization that this gospel is flawless even though it is ministered at times by flawed men. If I had sought the help of those that loved me, with their added strength, I look back now and know that victory would have been mine. They have given me strength along with the compassion of our Savior in these last few days that I have needed for a long, long time. Many ask, as I close, this: will the ministry continue? Yes, the ministry will continue. Under the guidance, leadership and directives (as best we know how and can) of the Louisiana District of the Assemblies of God, we will continue to take this gospel of Jesus Christ all over the world. I step out of this pulpit at the moment for an indeterminate period of time and we will leave that in the hands of the Lord. The Bible college of these young men and young ladies whom I have tried to set a standard for and have miserably failed, its most esteemed president, Ray Tresk -- I, too, beg you, the future pastors, evangelists and missionaries, to forgive me. But this Bible college will continue. Thank you. Thank you and God bless you.